New Delhi : With every passing day, social media is becoming a source that can spread fake news like fire in a jungle, hard to stop and with a harsh impact on its surroundings. 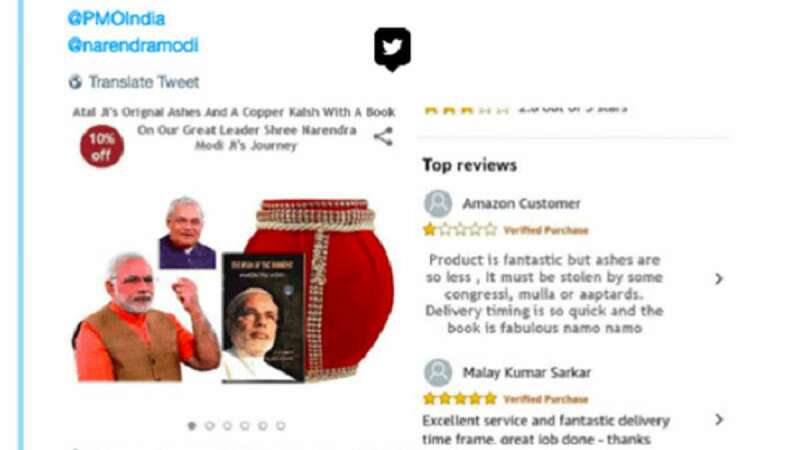 In a latest, a picture of former Prime Minister Atal Bihari Vajpayee's original ashes listed on famous e-commerce website Amazon went viral on various social media platforms, attracting mixed reactions from the society. On checking the source of the image and doing a pursuit on the credibility, it was found that the images were fake and photoshopped. "The politics over Vajpayee's death saddening. That his ashes are being sold is an insult to a great personality and a Bharatratna," Jararia had said in a tweet. The tweet was, however, deleted later. But he was not the only one to have fallen for the near-perfect photoshop job. "After the death of Atal ji, the politics which is going to be done by his ash is very tragic. Traded under the name of Bharat Ratna Vajpayee (this) is an insult to a great personality," said one Abhilash Pati on Twitter. What made us more curious was that product had reviews with a verified purchase tag, raising serious doubts over the credibility of Amazon sale in India. "Product is fantastic," said one of the featured product reviews on the fake image. "Excellent service and fantastic delivery time frame," said another review. The image pegged the price at Rs 999 and offered a discount of Rs 100 on the same. "Bumper Dhamaka. Save ₹100 on @amazonIN with Atal Bihari Vajpayee's ashes & get a complimentary book called 'Fool's Paradise," tweeted one Sania Maan.